(Nanowerk News) The rapid evolution of gadgets has brought us an impressive array of “smart” products from phones to tablets, and now watches and glasses. But they still haven’t broken free from their rigid form. Now scientists are reporting in the journal ACS Applied Materials & Interfaces ("Let It Shine: A Transparent and Photoluminescent Foldable Nanocellulose/Quantum Dot Paper") a new step toward bendable electronics. They have developed the first light-emitting, transparent and flexible paper out of environmentally friendly materials via a simple, suction-filtration method. Technology experts have long predicted the coming age of flexible electronics, and researchers have been working on multiple fronts to reach that goal. But many of the advances rely on petroleum-based plastics and toxic materials. Yu-Zhong Wang, Fei Song and colleagues wanted to seek a “greener” way forward. The researchers developed a thin, clear nanocellulose paper made out of wood flour and infused it with biocompatible quantum dots — tiny, semiconducting crystals — made out of zinc and selenium. 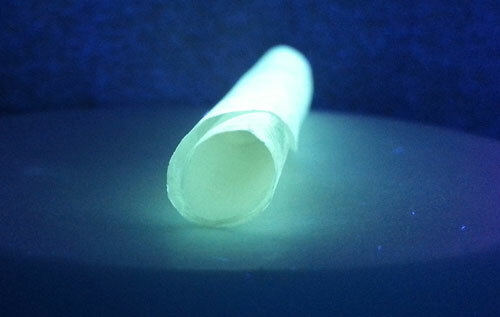 The paper glowed at room temperature and could be rolled and unrolled without cracking.